Wet-process phosphoric acid production generates significant amounts of foam and undesirable gases which limit plant production efficiency. In a typical wet-process phosphoric acid process, phosphate rock is reacted with sulfuric acid in large digesters or reactors. In addition to the calcium phosphate in the ore being converted to phosphoric acid (P2O5) and calcium sulfate (gypsum), there are numerous side reactions due to impurities in the rock. Carbon dioxide (CO2) content in the rock is a major contributor to foam and gas generation in the reactor. Significant foam presence on the liquid surface can lead to fugitive emissions from the reactor, overflows during start-up or upset conditions, and P2O5 loss to the exhaust gas scrubbing system. The entrained gases diminish the pumping efficiency of the system, and the foam itself takes up valuable head space in the reactors, effectively reducing production capacity. Both problems wreak havoc on the designed process parameters of the system which can result in more rapid scale formation in piping and plugging of filter media, both of which can lead to more shutdowns. When excess entrained gas and foam cause problems with sulfate control in the reaction due to poor circulation, there can also be losses of the valuable P2O5, partly due to poor gypsum crystal formation which reduces acid filtration rates. When certain impurities are present in the phosphate rock, either organic or inorganic, they act as surfactants and tend to stabilize the gases that are released in the rock / sulfuric acid reaction, making surface foam more stable and difficult to control, and limiting the ability of the gases to disengage from the reactor slurry. When the resulting gases are entrained in the slurry, they decrease agitation and circulation by lowering pumping and mixing efficiencies, and ultimately result in lower raw material recoveries due to P2O5 carryover into flash coolers and evaporators. More detailed technical information on these mechanisms is available in a paper entitled When Nameplate Is Not Enough—Expanding Phos Acid Capacity with Defoamers. Contact us to request a copy of this paper. One of the major challenges that phosphoric acid producers face in achieving desired plant production rates and efficiencies is identifying the optimal means of removing such gases that are liberated during these production processes. Mechanical equipment can be added to plants for this purpose but is capital intensive to install, equally expensive to maintain and provides only a partial solution at best. Process chemical additives such as defoamers have become the universally accepted “best practice” alternative for accelerating the removal of unwanted gases and improving plant performance. The addition of a defoamer during phosphoric acid production can facilitate higher capacity utilization and optimal output of finished product. An ideal phosphoric acid defoamer not only has the ability to “knock down” surface foam in the digester but also to reduce entrained CO2 gas bubbles in the slurry. 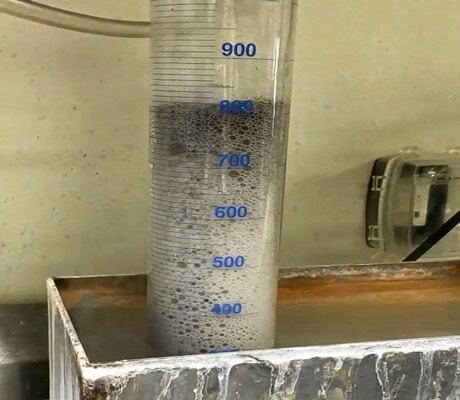 Design and choice of an appropriate defoamer requires an understanding of the characteristics of the phosphate rock, the particular type of phosphoric acid production processes and the intended operating parameters. In order for dissolved gases to reach the liquid surface and release the CO2 / air within the bubble structure, there must be some mechanism to overcome the weak molecular attractions that keep the natural buoyancy of the gas bubbles from moving towards the surface. ArrMaz defoamers maximize the removal of these gases and their undesirable influence on phosphoric acid production processes by reducing the surface tension on the gas bubble surface. Converting this knowledge into effective defoamer formulation and application requires extensive experience and access to the operational and feedstock variables which determine the nature of the process challenge. ArrMaz has a long history of supplying products to the phosphate industry and it remains a critical strategic focus for us today. That focus has led us to develop an extensive range of defoamers customized for the specific operating and raw material conditions of our customers. 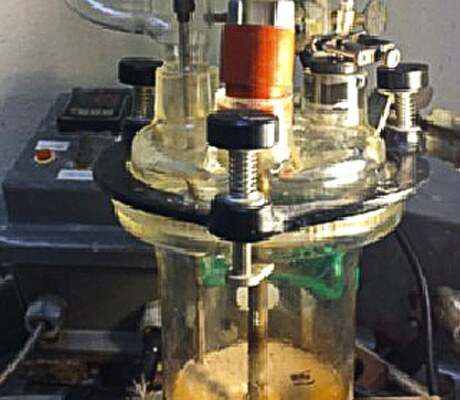 The defoamers remain functional within phosphoric acid reactors for long periods of time without breaking down. This provides degassing performance of entrained gases that continues through multiple cycles of reaction, filtration and recycle acid flow. Quickly go into solution in the phosphoric acid within the reactors, providing immediate results in breaking surface foam. They also have the added benefit of being more cost-effective if the foam problem is less severe or is a surface issue only. Exist longer in a phosphoric acid medium. These specialty defoamers perform especially well in rubber-lined evaporators and fertilizer scrubber systems and do not damage rubber linings. 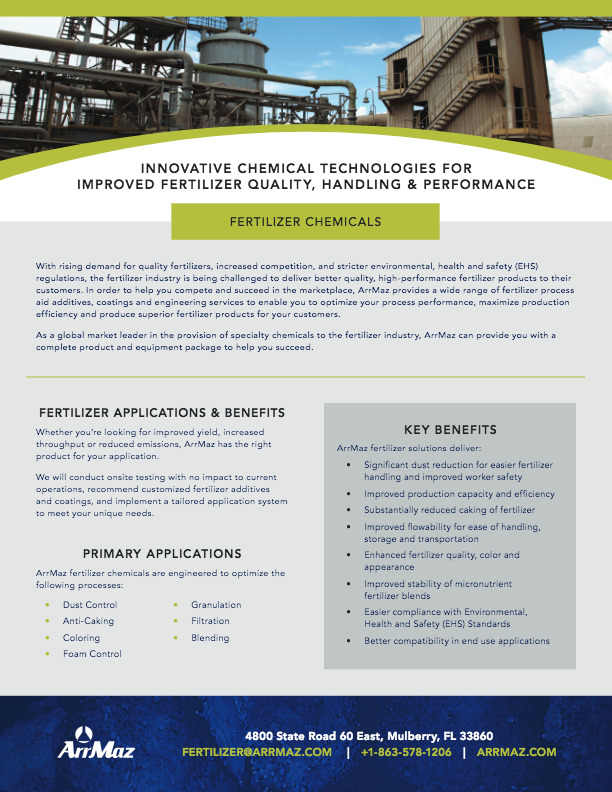 For decades, ArrMaz has been the world’s leading supplier of defoamers for phosphoric acid production. We welcome the opportunity to deploy our research scientists, engineers and technical experts to help solve your specific phosphoric acid production challenges.